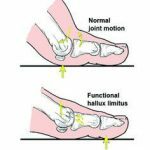 What is Structural Hallux Limitis? 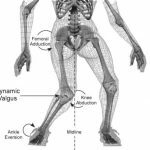 known as the first “MTP” is a mechanically and structurally important joint during normal walking and running gait as its function has global importance on the foot-ankle complex, knee joint as well as the hip and lower back. If the first MTP joint is not moving correctly it can result in abnormal biomechanics starting with pronation of the foot and ankle (results in excessive pronation), excessive internal rotation at the knee (leads to excessive shearing forces) and excessive internal rotation of the hip which can place strain on the Sacroiliac joints (SI joints) and lower back. This means that many running or walking related injuries might be traced back to the big toe! “What is mechanically connected is functionally related”, a professor of mine used to say. Overtime due to excessive strain and load on your first MTP the bone and joint will begin to wear out more quickly than the other side. The end result is cartilage deterioration also known as arthritis or Degenerative Joint Disease (DJD). The first MTP joint may become swollen, red and painful during activities such as walking, running and jumping and if left untreated will result in a cascading effect that will have consequences on the rest of your foot, knee, hip and even your lower back. 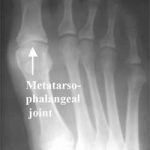 What are Symptoms Associated with Structural Hallux Limitis? Look down at your feet and ask yourself the question, “Is one of my big toe joints (first MTP) larger than the other”? Do you experience any pain in that MTP joint that is larger than the other? Does my first MTP joint hurt when I am weight bearing and run, walk or do toe raises? Have I been told I over pronate? 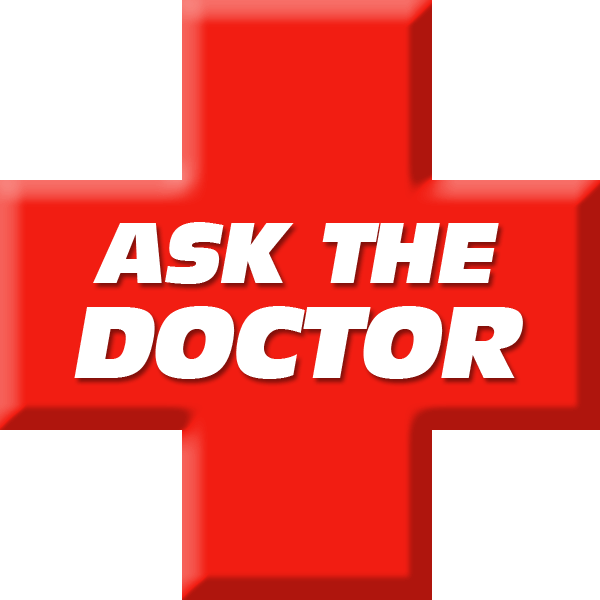 While it is not necessary for your answers to be yes to these four questions it is significant if you answered yes to any of them and you may be suffering from structural hallux limitis. As was discussed earlier “What is mechanically connected is functionally related”. Because your knee is mechanically connected to your foot via your tibia bone it is possible you are experiencing pain in your knee due to structural hallux limitis. It has always been interesting to me that people accept a diagnosis of “Overuse” even though they are only experiencing pain on one side of their body. If the pain was due to overuse why would it only be on one side when you walk, run or jump on both legs and feet. The obvious answer is that something is wrong with one of your sides and unless you have been screened for Structural Hallux Limitis you may be missing the root cause of the problem. Think of this analogy, “If you step on a cat’s tail does the tail scream”? 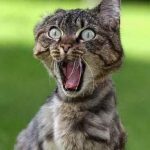 If you step on a cats tail does the tail scream? You can force Ibuprofen down the cats throat all day while applying ice but the problem will never go away until you remove your foot off the cats tail (by the way I love cats…it’s only an analogy people). The bottom line is that if you are experiencing pain in your foot, ankle, knee, hip or lower back and you also happen to have a painful first MTP joint or been told you over pronate you may have Structural Hallux Limitis. How do you Diagnose Structural Hallux Limitis? The first part of any good diagnosis starts with your history. If you answered yes to any of the four questions above regarding pain in your first MTP or over pronation than you should be screened for Structural Hallux Limitis. You can have a doctor, therapist, friend or loved one perform this test for you. While standing, lean slightly forward so that pressure is applied across the ball of your foot. Have the person try to flex your NON PAINFUL BIG TOE back towards your shin (this movement is referred to as dorsiflexion). does it bend less than the other side? Is it painful? Make note of approximately how much range of motion there is in that joint and whether or not it is painful during dorsiflexion. Now dorsiflex the PAINFUL big toe back towards your shin. How much range of motion is there and how painful is it compared to the non-symptomatic side? An X-ray can also be performed to visualize the joint space in your first MTP joints comparing the non-painful side to the painful side. Of course there are other tests that can be done such as computerized gait analysis and other standardized tests but the test described above and possibly the X-ray will suffice. How do you Treat Structural Hallux Limitis? Treatment options may vary depending on what type of doctor you see. It is always odd to me when patients tell me they saw an orthopedic surgeon and they recommended surgery but that the patient is unwilling to do surgery…….maybe because I am “in the industry” but it seems obvious that if you see a surgeon they will offer you surgery. Yet other doctors may offer you physical therapy to correct your Structural Hallux Limitis. The physical therapist is likely to offer you stretching and strengthening exercises…..which usually will not work as it is a joint problem not a muscle or tendon problem. In fact trying to stretch or strengthen Structural Hallux Limitis often results in more pain and decreased function for patients. Another doctor may suggest cortisone injections into the joint to reduce the inflammation. Besides the deteriorating effect cortisone will have on your joint resulting in more long term damage it also does not address the Structural component of the condition. Recently Platelet Rich Plasma Therapy (PRP) and Stem Cell injections have become popular. PRP is intended for muscle, tendon and ligament and has never been shown to help with cartilage. Stem Cell may show some promise but currently there is little evidence to show that it is effective in regenerating cartilage especially at your first MTP joint. In addition neither of these interventions does anything to address the mechanical nature of Structural Hallux Limitis. 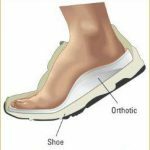 In my experience the only way to effectively address the mechanical nature of Structural Hallux Limitis is through footwear and insoles also called orthotics. While there are many different over the counter insoles available few of them effectively address the first MTP joint. For this reason I have found custom orthotics and foot wear modification to be the most effective ways to mechanically address the problem. An example of footwear modification would be to either stop or severely limit the amount of time spent wearing heeled shoes. Heels shift stress and pressure to your forefoot and first MTP joint which would in theory aggravate your condition. While most people do not think of a running shoe as being a “heeled shoe” most of them are. Examine your running shoe. Is the cushioning higher in the back than in the front? In fact, most running shoes are almost twice as thick in the back as in the front! However, there are running shoe brands and models that have either a low heel to toe ratio (known as “low drop) or even a “0” heel to toe ratio. These running shoes have become known as “minimalist” shoes and would in theory be helpful to your Structural Hallux Limitis. Custom orthotics can be made that can also reduce pressure on your first MTP joint and may work in synergy with your new choice in footwear. Pricing of custom orthotics can differ an in truth most custom orthotics are not all that custom. Here is a simple test to see if your orthotics are actually custom. Either measure your feet using a Brannack device or stand on a piece of paper on a hard, flat surface. Draw a line around your feet. Now measure from heel to toe with a ruler. Are both feet the exact same? Now measure your orthotics. Do they measure the exact same? If the answer is yes than they may not be as customized as you think. You can also place the orthotic on top of the foot outline. Is the orthotic more narrow than your actual foot? Is it wider than your actual foot? Again your orthotics may not be a custom as you once thought! In order for a custom orthotic to be effective it has to fit in your shoe (practical) and must be comfortable or you will not wear it. It is unfortunate how many patients come to our clinic with multiple pairs of custom orthotics that were not engineered to meet the above three criteria. Lucky for them we can and will save them money by modifying their existing orthotics for less than half the price of new custom devices! !